Tire Machèt is a Créole martial arts hybrid. It synthesizes elements of fencing, stick, and machèt art forms. Its genesis occurred prior to the Haitian Slave Revolt, as a solution to rebels not having standard weapons to fight the enemy. Machèt fighting then became a valued skill, and part of the Haitian Army's basic training. Down through the history of military training, Tire Machèt has acquired a sacred symbolism owing to the Haitian Slave Revolt. Stick fighting, as well as Tire Machèt, is grounded in African practices that were imported along with Congolese slaves to Haiti in colonial times. 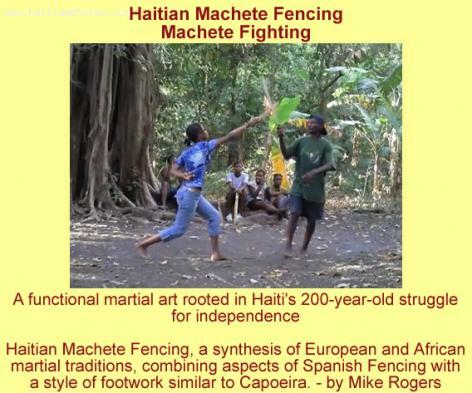 Stick fighting and Tire Machèt have gained strength as martial arts disciplines, due to Haiti's isolation from the world. Although Haiti endured unimaginable poverty by being cut off from the rest of the world, it enabled important primitive traditions to flourish, among them Tire Machèt. When France and Spain invaded Haiti in the 1700s, they introduced the art of fencing. As European culture took hold, Haiti's military commanders gravitated towards the refinements of European culture. They readily learned the art of fencing from the French, which they used against them in military campaigns over time. Henri Christophe and Jean-Jacques Dessalines, both important figures during Haiti's fight for independence, mastered the skill and used it against untrustworthy underlings. Eventually, Tire Machèt and its cousin, stick fighting, fused with the European fighting traditions. The outcome has been the modern form of Tire Machèt. Here is an article written about Jean-Louis Michel, a Master in Haitian Fencing. You can read more about it here.